This is such a quick and easy way to enjoy a vegetable often forgotten. 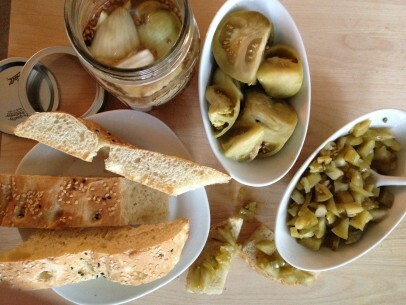 I love making relish from the pickled green tomatoes and the best part is they pickle very quickly so you can start enjoying them about 2 weeks after putting them up. If you don’t have a garden, you probably know someone who does and is more than happy to share a bag of green tomatoes with you! A few simple ingredients, a salty sweet brine, jars for preserving and you’ll be good to go. I most often use 16 oz mason jars for this recipe. The brine and spice measurements will make enough to preserve 5-6 jars. 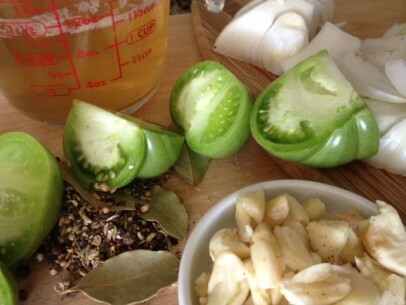 Both the brine and spice mixture are easily scalable if you have a bigger batch of green tomatoes. You can also use hinged preserving jars for this recipe as well. Depending on the size of your green tomatoes, which usually are smaller than what their ripened counterparts were earlier in the season, cut them into quarters. If some have blemishes or scars from where they’ve touched the ground, just slice off the mark and use the rest of the tomato. And if you’re using little, tiny green tomatoes, be sure to cut those in half so that the pickling brine gets right inside them. Cut your onion into maybe 2×2 or 3″ chunks. You want to make sure they’re small enough to fit easily into your jar. Once peeled, just crush the garlic with the flat of your knife. These aromatics are for flavoring so don’t worry to much about how they look! 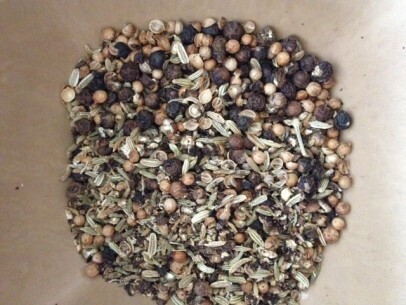 For the spice mixture, gently toast your spices and then crack them either in your mortar and pestle or in a ziploc bag. No need to grind them, we’re just looking for a good crack to release all the flavors into the tomatoes. Start each jar with a teaspoon of spices, a couple of pieces of onion and a couple of pieces of crushed garlic. 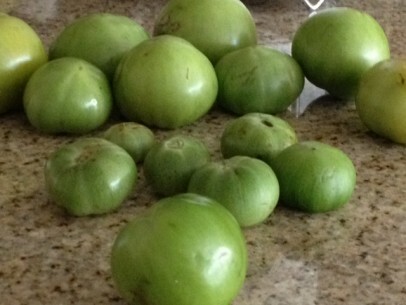 Then start to pack in your quartered green tomatoes. The tomatoes themselves are pretty hard so you don’t need to be too careful, push away and pack in as you go. Once you’re about a third of the way up, add another teaspoon of spices and more onions and garlic. Repeat until you come to the top of the jar. At this point, really push down hard and pack everything down into the jar. When the last spoon of spices is added to the top, pour cooled brine into your jar until you’re about 1/2 from the very top. Give your tomatoes once last push as the brine moves things around a bit. Cover carefully with lid and screw on band tightly. Store jars in a cool, dark place for 10-12 days. 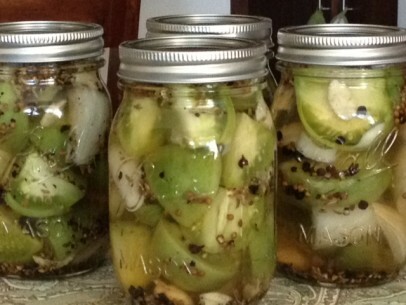 Once opened, keep your pickled green tomato jar in the refrigerator. These are delicious as a side to chickpea fritters and savory onion pancakes or as a relish to top fried squash, eggplant or lagana (traditional flatbread). Have fun pairing them with all sorts of dishes, you’ll find a million ways to enjoy them! To sterilize the jars, fill each with boiling water and dip both the rings and lids into boiling water. Allow to dry on a clean dish towel and wait until the jars of water cool before pouring them out and drying, upside down. How long is their unopened shelf life?